Keith has done extensive analysis of the game and his findings are outlined in the forums. In its original form, Phwar is an almost guaranteed draw. To counteract this, a few new rules have been added that you will not find in the official rules document. A new victory condition has been added. 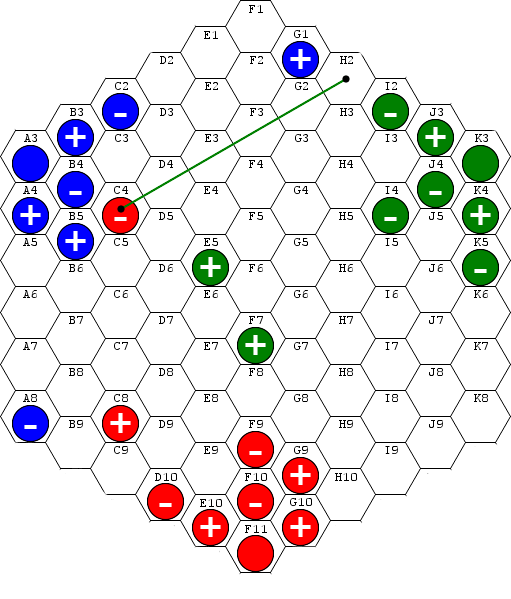 While last-man-standing is still a valid end-of-game trigger, the first person to occupy the centre hex (F6) with their neutron will also instantly win the game. Pieces cannot pass through the centre hex (F6). They can enter it then exit it on the next turn, but not pass directly through it.